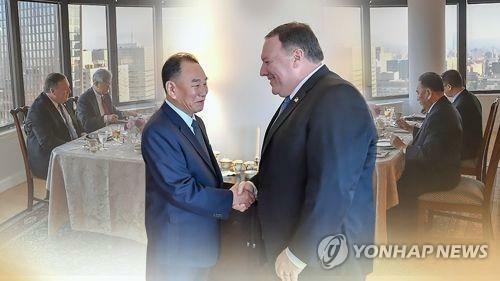 WASHINGTON, Nov. 5 (Yonhap) — U.S. Secretary of State Mike Pompeo will meet with his North Korean counterpart in New York this week to continue discussions on the denuclearization of the regime, the State Department said Monday. “Secretary Pompeo will travel to New York City with Special Representative for North Korea Stephen Biegun to meet with DPRK Vice Chairman of the Central Committee Kim Yong Chol on November 8,” the statement said. “The Secretary and Vice Chairman Kim will discuss making progress on all four pillars of the Singapore Summit joint statement, including achieving the final, fully verified denuclearization of the DPRK,” it added. DPRK stands for North Korea’s formal name, the Democratic People’s Republic of Korea. The first summit yielded a joint statement committing the North to work toward “complete denuclearization” of the Korean Peninsula in exchange for security guarantees from the U.S. But the deal has resulted in few tangible results, other than the U.S. suspension of some military exercises with South Korea, and North Korea’s stated dismantlement of certain nuclear and missile testing sites, which the U.S. says falls short of its expectations. The two met in May after Trump called off the first summit. That meeting, and Kim Yong-chol’s subsequent visit with Trump at the White House, led the U.S. president to put the summit back on for June 12 in Singapore. Pompeo said earlier that he plans to discuss with his counterpart the North Korean leader’s promise to allow international inspectors into the nuclear testing site in Punggye-ri and the missile engine testing site in Dongchang-ri to verify their dismantlement. South Korea’s state spy agency was quoted as telling lawmakers last week that North Korea appears to be preparing for a visit by the experts. “Not only complete denuclearization, but our capacity to verify that that has taken place is also a prerequisite to lifting economic sanctions,” he said on CBS. Last week, the North’s foreign ministry threatened to return to Pyongyang’s former policy of “byeongjin,” which calls for simultaneously developing its nuclear program and economy, if the U.S. did not start lifting sanctions.